When working with large infrastructures, especially when we define a new infrastructure for an existing service, it is time to carry out the final change, and start using all services with the new environment. If your new infrastructure is in Amazon AWS, these simple tips can make your migration more comfortable. The Route 53 DNS service allows you to assign weights to the different entries. This is very useful to be able to change the traffic gradually from the old IPs to the new ones, and see how our platform behaves as the traffic increases. All we have to do is create two equal entries, each pointing to the new destination, and distribute the total weight (255) between each entry. As we change it, Amazon will direct more traffic to the new destination until the process is complete. Amazon’s infrastructure is reactive to the different increases or decreases in traffic that are occurring. In ELB load balancers, when the traffic increases suddenly, it is normal that the IPs of these balancers change, and the latency decreases even if the traffic increases. This seems to indicate that Amazon detects the load increase and switches to an ELB with more capacity that can guarantee an adequate response for the new traffic. Therefore, before migrating, it is advisable to launch a high number of requests to the balancer (or to the entire infrastructure) using Jmeter or a similar program, so that the balancer detects the change of traffic and assigns us new balancers of more capacity. This way we will be more prepared to process the new traffic. If your new infrastructure has a distributed cache system such as CloudFront or Fastly, we can anticipate the change and improve the performance of it (while reducing the load of the platform) by preloading content into it. If we expect that most of the traffic comes from a specific area, when launching requests from that area the system will request and store the result in its cache, so when making the change it will not be necessary to make the requests again . If our infrastructure is ready to generate static content (for example clippings with Lambda against S3), leaving already generated those contents that we hope will be used will avoid an unnecessary burden in the first moments of the change of platform. Unless our platform is completely serverless , it is normal to expect that the EC2 instances will escalate (new instances will be activated due to an increase in load). This process (depending on your configuration), can take several minutes, during which the performance of the platform can be reduced, or even stopped if the load increase is very high. Therefore, for platform migration it is advisable to start with one or two more instances, which allow us to avoid problems if we receive more load than expected, or if we have dimensioned our resources by default. In short, prepare for the worst and try to leave everything generated or prepared before you start, so that the change is as traumatic as possible. 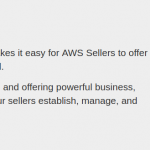 For all users of Amazon Web Services, Amazon has an online market where you can buy everything related to AWS. Thus, you can find AMI’s that come prepared with the specific software you need, CloudFormation scripts to create a specific platform, custom ECS containers, etc. In addition, Amazon gives you the option to upload your products to your market and make money with them. 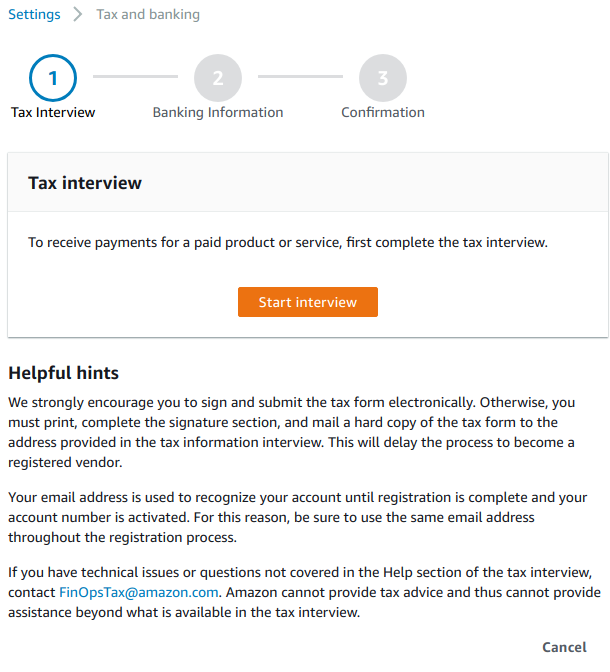 Although the process to register can be delayed in time (due to the different verifications required), it is not really complicated. 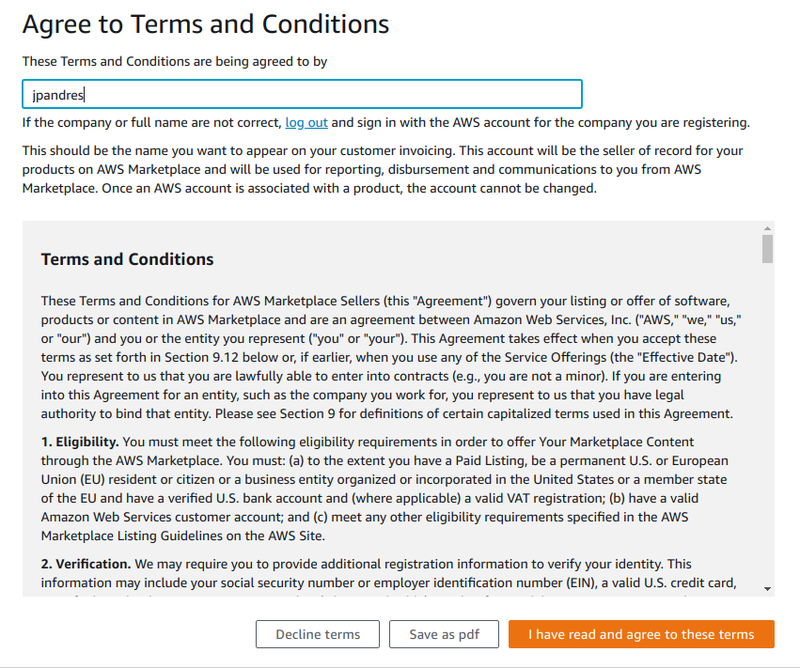 The first step is to register our account in the AWS Marketplace. Although the access will be made with our root user (or with a user to whom we have given permissions), we must complete the registration process as if it were another service. 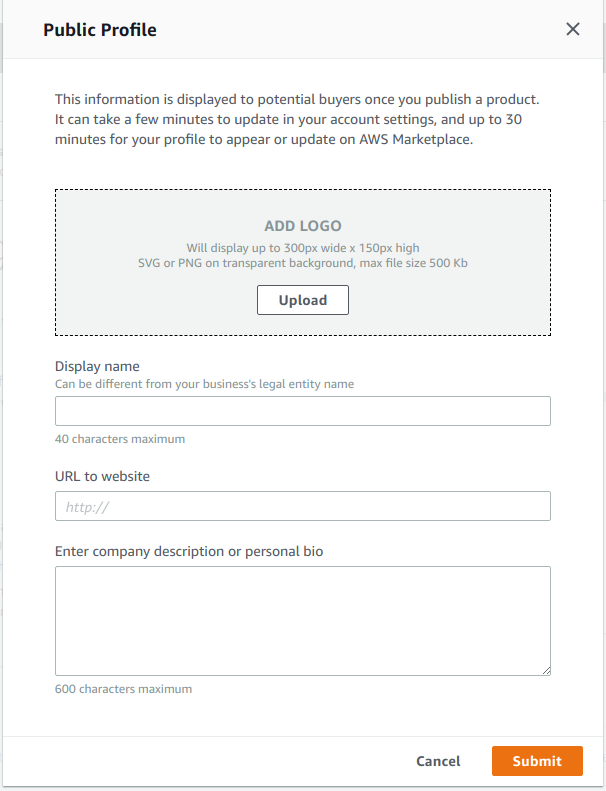 The registration process will be carried out from the main cover of AWS Marketplace . 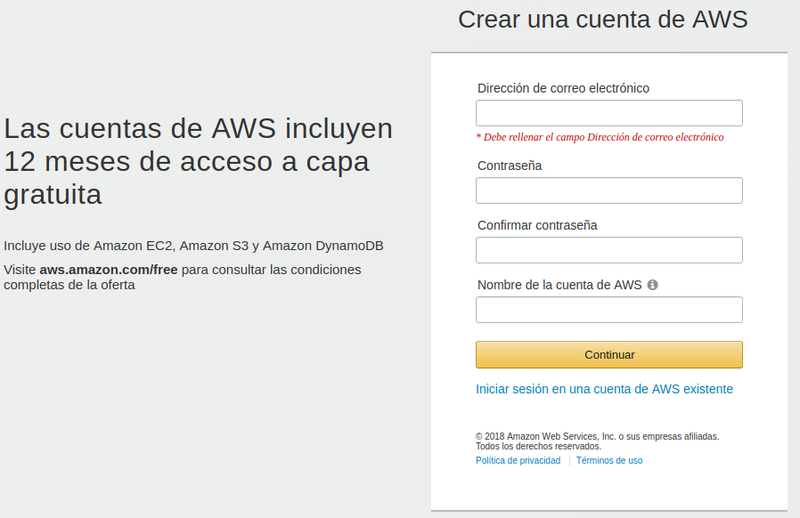 To register, we must press the button “Register as a seller in the Marketplace”, being logged in with our AWS account. The first step will be to accept the terms and conditions of the Market, which we can download in PDF format for a more comfortable reading. 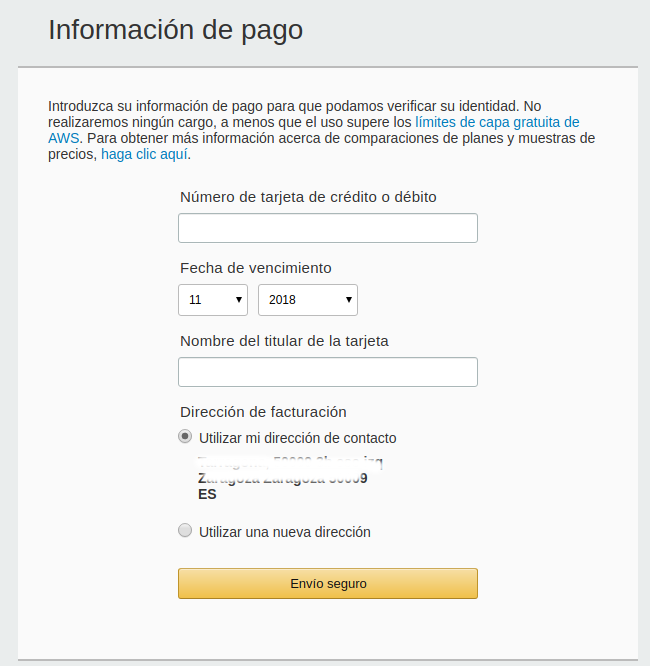 Although activating our account and accepting the terms is already possible to start selling, they will only allow us to give away products, since in order to be able to charge for them, we must complete the financial information. In addition, the advisable thing to inspire confidence is to also fill our profile, so that the people who buy our products can see information about us. 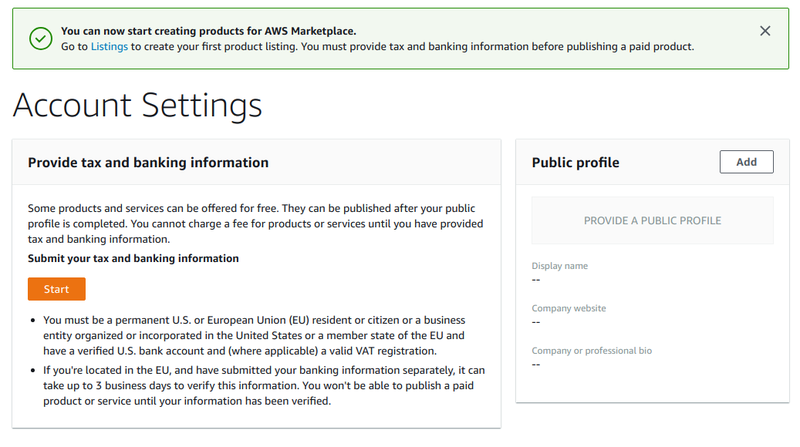 On the cover we will be notified that we can start uploading products, but they will only allow us to offer free products, since we have not indicated the banking and tax information. 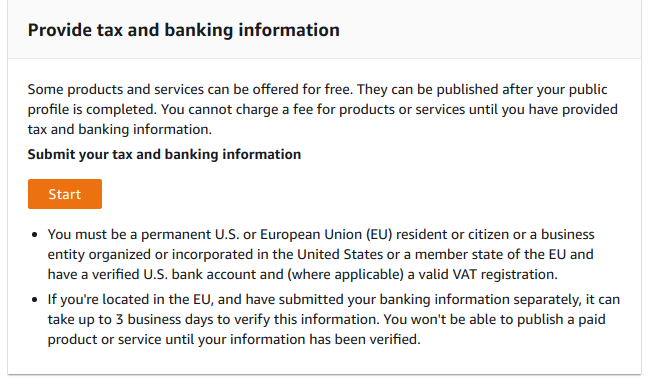 In order to sell products on the AWS Marketplace, we must be citizens or companies from Europe or the United States, and have a bank account at a US bank. 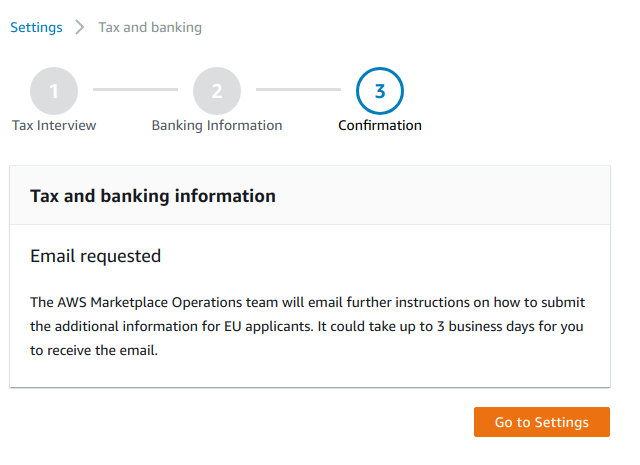 This part of the process is the longest part, since Amazon must verify each one of the data that we indicate and, especially if we are European, the process can get a lot longer. In my case, the entire process from the time of discharge until I was able to upload my first payment AMI, was delayed more than 15 days. 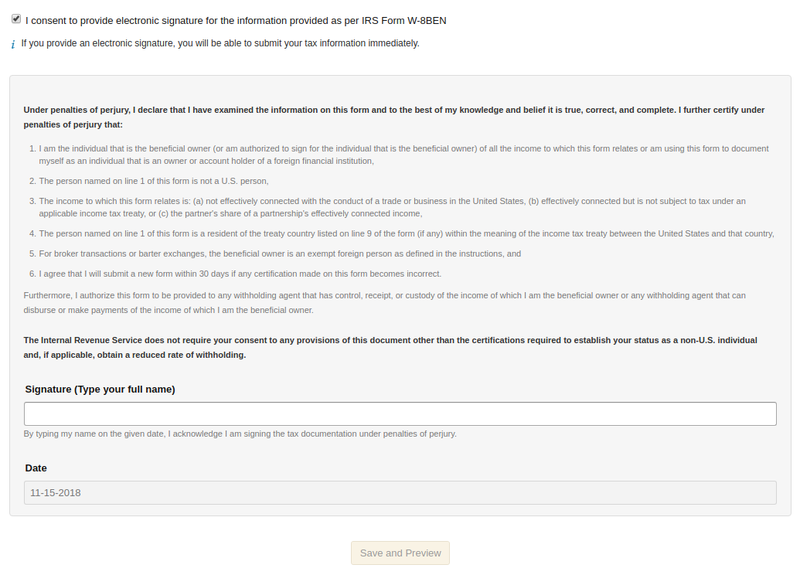 The first questions are aimed at determining what type of form we should fill out (it is different if you are a citizen or company, European or US, etc. 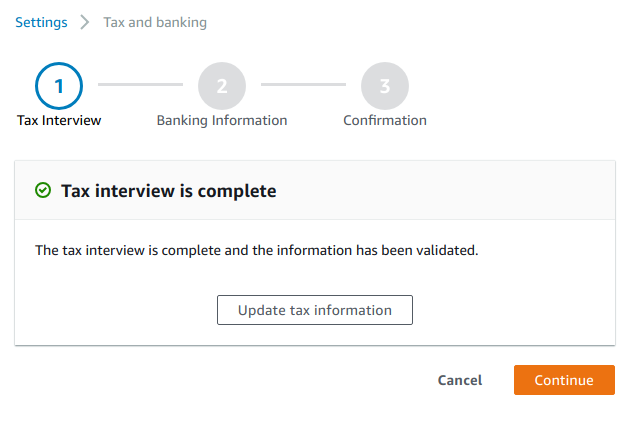 According to the answers of the previous step, they will ask us for more detailed information, in order to make the necessary invoices. 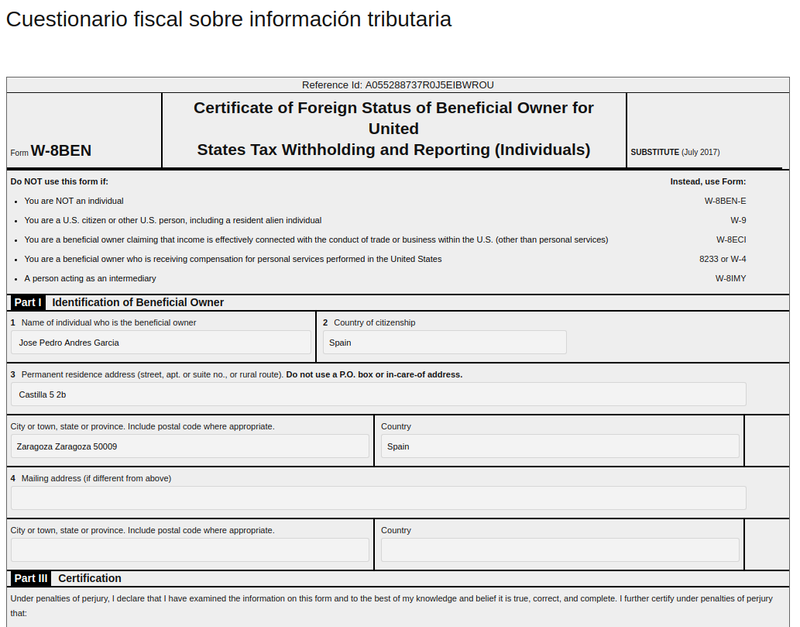 After the declaration process, we will be asked to indicate our fiscal data to complete this first step. 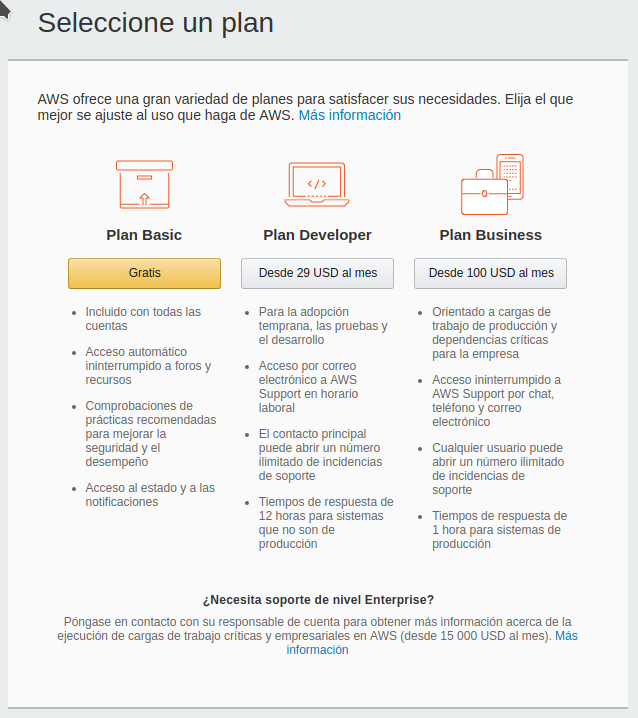 With the fiscal information already complete, the next step is to indicate the account where AWS will make us the income of the money generated with the sale of products in its market. The bank account that we indicate must be from a US bank. 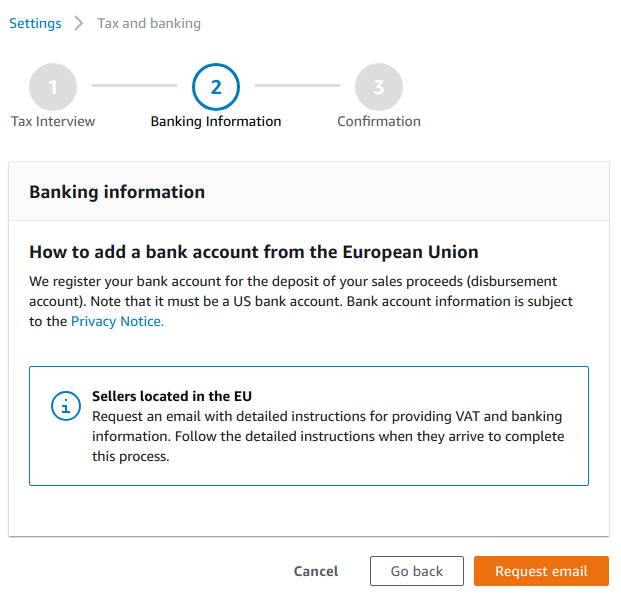 If we have indicated that we are European citizens (or companies), Amazon gives us the option of working with Hiperwallet , which can offer us a virtual bank account in the USA, with which we can proceed. 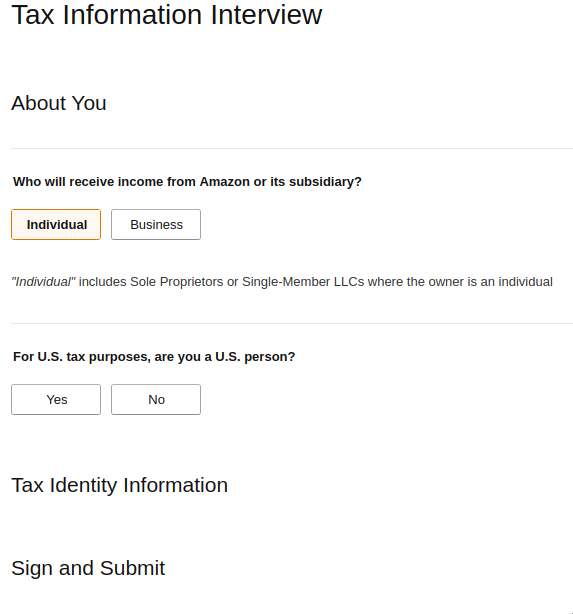 In any case, the process involves asking Amazon to send us an email with information, where they will send us a link to directly register our account in Hyperwallet. After indicating all the steps, and once the verification process is finished (which may take a long time), we will be able to sell products in the Amazon marketplace. 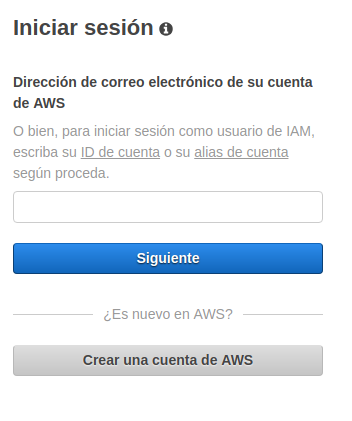 One of the recommended ways to perform sending notifications with SNS , is to create a user of IAM (the AWS Identity Management System). Thus, we will have a user with their access codes, configured only to be able to send notifications, which offers us greater security. First step is always to access the AWS console . 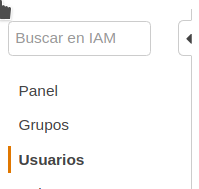 Once inside, in the search bar we will look for “IAM” to be able to access the identity console. 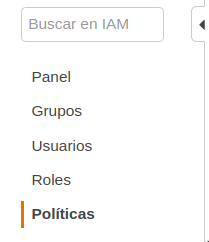 Once we are in the IAM welcome screen, we will start creating a new Policy, clicking on the “Policies” link in the menu on the left. Since our user has to have an applied policy that gives him permission, we will start creating this policy, so that the creation process is easier to see. 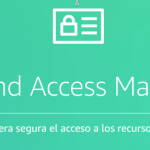 Within the default policies of IAM we can find already defined policies for most of the services, although we will define our own to restrict access to the user as much as possible. Visual editor: to navigate through existing policies and choose the ones we want. 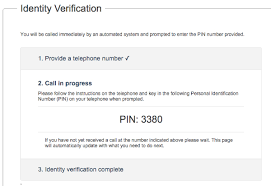 JSON: to directly indicate the permissions that we want to apply. "Resource": "arn: aws: sns: eu-west-1: 1836171893615: myTopic"
In the Resource section we must indicate the arn of the topic that we are going to use for the shipments. By clicking on Review policy, it will be verified that the code we have set is correct, and we will go to the verification screen. 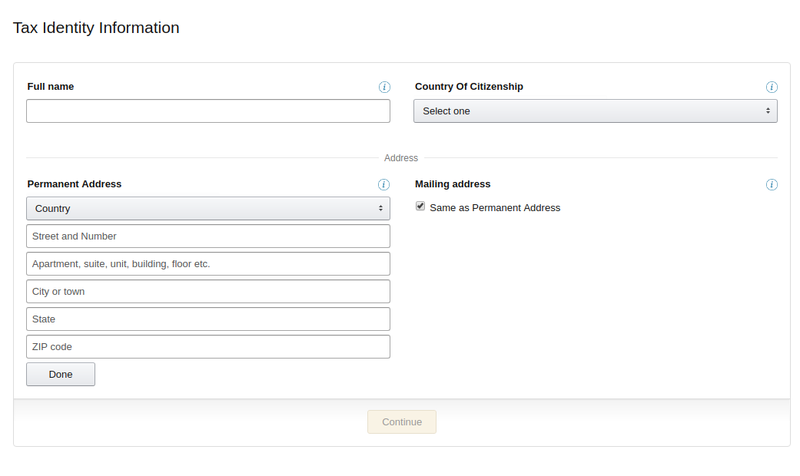 Last step is to indicate a name for the policy, and a brief description, and clicking on “Create a policy”, we will have our policy created. On left menu we will see the different options, and we will access the users tab by clicking on the “Users” link. Inside the user screen we will see the active users (if any), and we can create a new user by clicking on the “Add user (s)” button. Inside the user creation screen, first we will indicate the name we want it to have, and that we will access it in a programmatic way. We use the search engine to locate the policy that we have just created. Mark the policy or policies that we want add. Once finished, we click on the labels button to go to the labels screen. Here we can indicate the labels that we want (it is optional), to identify the characteristics of that user. Once we finish, we will click on the “Next: review” button to finish. 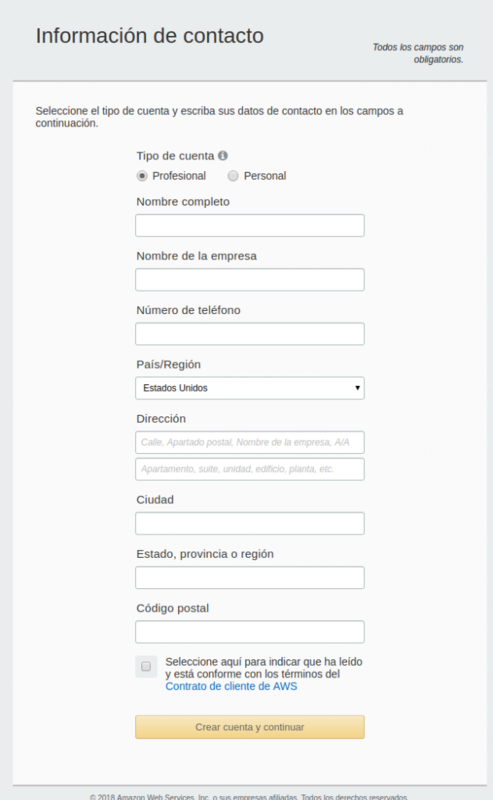 Last step to create the user is to review the configuration of this and click on the “Create user” button. If everything went well, we will see a message indicating that we have already created the user, and we can download or see the keys to connect with that user. After that, we can use this data to send SNS notifications. Inside the Amazon Web Services, SNS is one of two services that deal with sending notifications. SNS stands for Simple Notification Service, and is the name that best defines its function: sending notifications to subscribers quickly and reliably. SNS is a completely unattended and managed service, which operates in high availability, and in a safe and durable manner. The main advantage of SNS is that we do not need to know anything about its structure or operation, since it is designed so that our only job is to integrate our application with the SNS API , and SNS is responsible for all message distribution work. What are the costs of SNS? 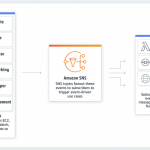 SNS is a service designed for the mass sending of messages that, like the rest of AWS services, has a very low cost, based on the volume of messages sent. In addition, the free AWS layer for SNS includes the first million messages, which will be more than enough for basic uses of the service. It is important to clarify that the sending of messages via SMS if it has a different cost (is charged for each SMS sent), due to the characteristics of this type of service.